The owner has been at this place for some time. Ever since he moved here, he had not done anything to the front and back yards. The lawns went brown during the drought, looking quite barren. Even after the very wet year of 2017, they did not come back. 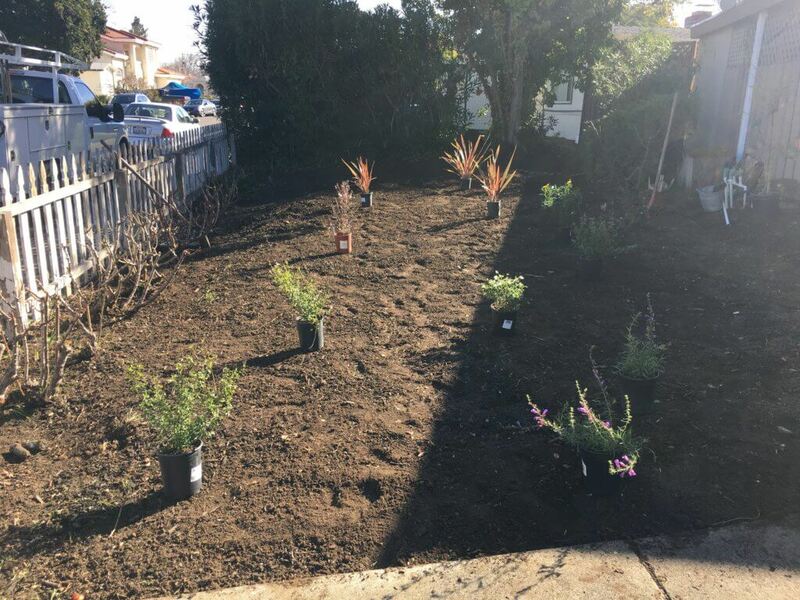 Finally, when the owner heard about the Santa Clara Landscape Rebate Program in his city, he decided it was the time to start doing something. 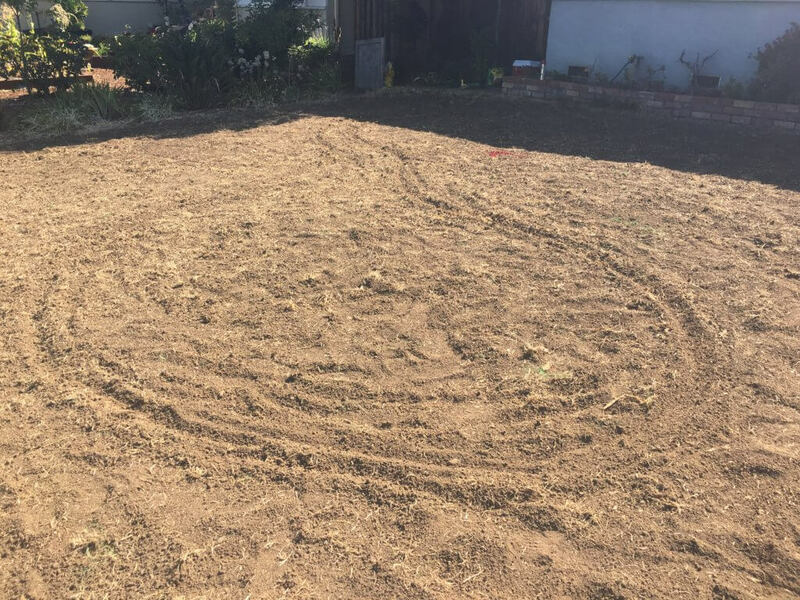 He wanted to build a garden that will meet all the requirements of the rebate program. After he did some searches online, he found the website of Water Efficient Garden, where he got exactly the information he needed. In the backyard there is an olive tree. It is a large tree with lots of black olives lying on the ground. The owner wanted to have a simple and easy conversion which would meet all the requirements of the Rebate Program. Luckily, there are a large number of attractive drought tolerant plants to choose from. When selected carefully, even just with a few, the plants can make an elegant and water efficient garden. 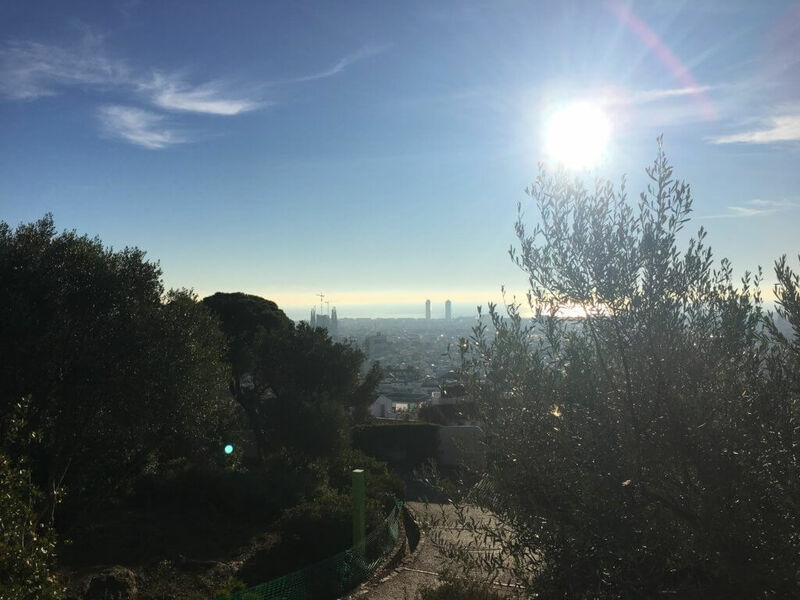 In Mediterranean areas like Spain where the olive trees originate from, the tree can be seen everywhere: in the open fields, at the hill tops, etc. There, lavender, rosemary, and other Mediterranean natives also grow in abundance. They are well adapted to the climate there, very drought tolerant, yet with attractive flowers and aroma. California shares the same Mediterranean climate, so these plants also do well here. For the backyard design, it was decided some of these plants will be used, keeping the Mediterranean vibe alive. 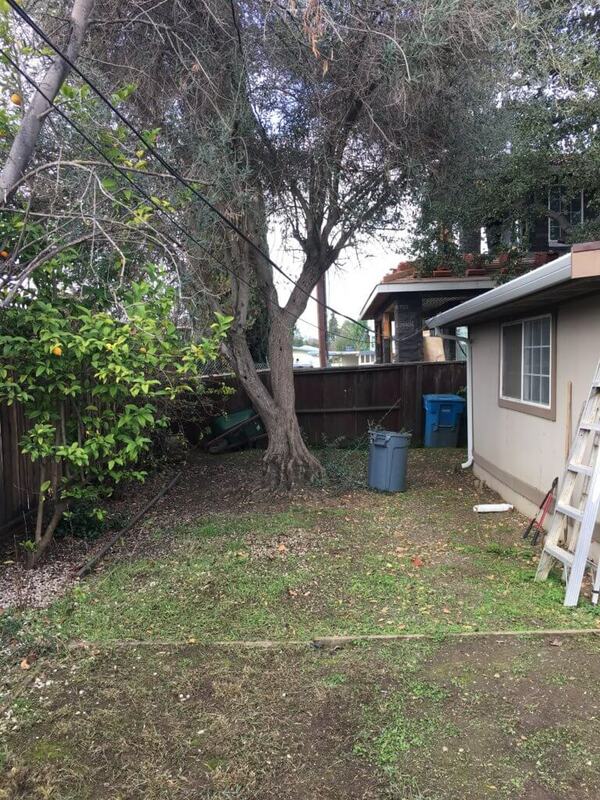 The front yard sits next to the side of the house, with thick bushes almost completely blocking out the wall. When the project started, the grasses were removed, the bushes cut, exposing the wall. On it there are two down spouts, pointing to the yard below (only one is shown in this photo). So, when it rains, all the rainwater from the roof will go into the yard, not driveway or other impervious surfaces, which is excellent. After the historical drought that ended just last year, people all realize now how valuable water really is. With population increase and climate change, our demand for water will only increase. On the other hand, as the Sierra Nevada snowpack will “very likely” shrink by 30% in the next 20 years, the supply will decrease. How can we have enough water to meet our demand? 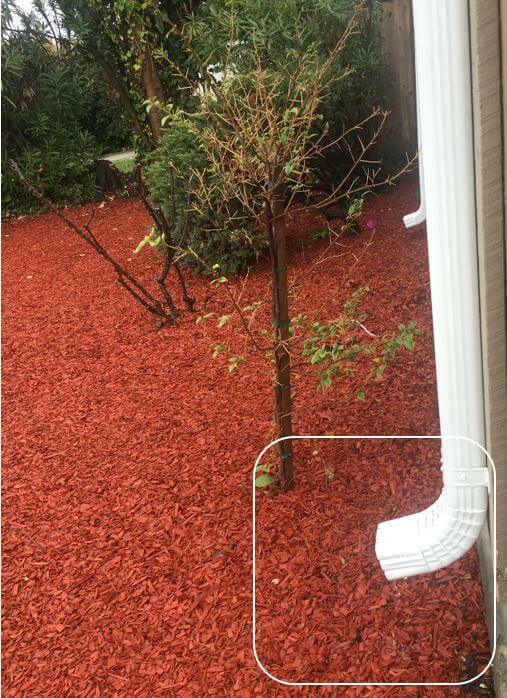 If the rain water is directed to impervious surfaces like driveway, the water will just become runoff and be sent right away, which is a waste for this valuable water resource. 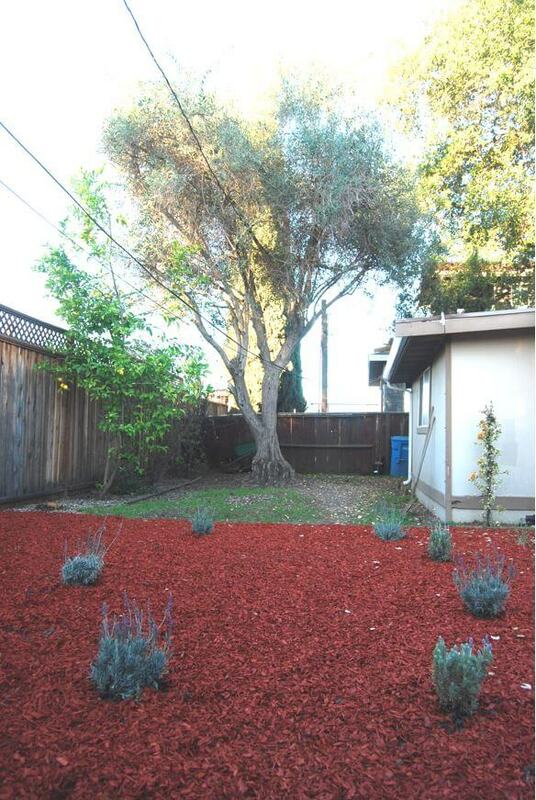 In places with natural ground cover, 50% of the rain water can go back in the soil. In urban areas where a big chunk of surfaces are impervious, only about 15% of water goes back. 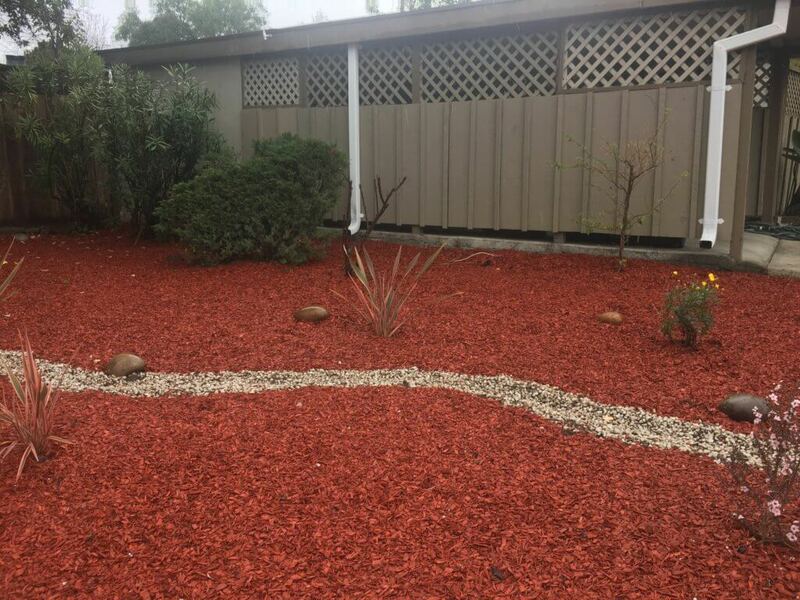 Specifically, only 5% of the water infiltrates deep down, versus 25% with natural ground cover, which seriously deprives the ground from water recharging that is badly needed. So, when it rains, we should direct as much water as possible to our garden, let it water the plants, soak into the soil, and recharge the ground water. By capturing every drop, we can make the best use of the water that fall on our roof every year. To further absorb the rainwater, a small ditch was made in the middle of the garden. 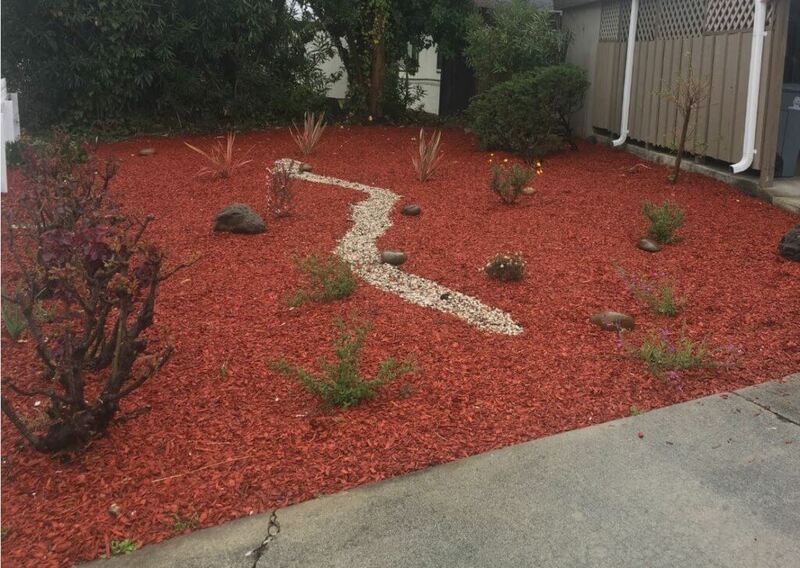 Filled with pebble stones, the “river” can take all the rain water coming down the two down sprouts when it rains. In addition to capturing the rain water, it adds a vivid element to the landscape, making it look more lively and appealing. The rocks scattering across the garden add yet more textures and balance out the “river” in the middle. 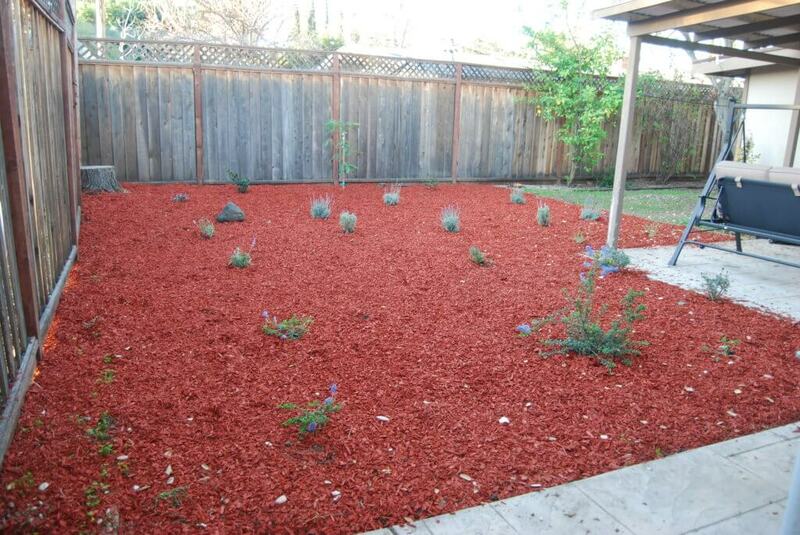 All the plants are drought tolerant. They sport pink, purple, yellow and white blossoms, making the garden not just water efficient, but also cheerful. For the backyard, in front of the Olive tree, another Mediterranean native – the lavenders, add color and aroma. 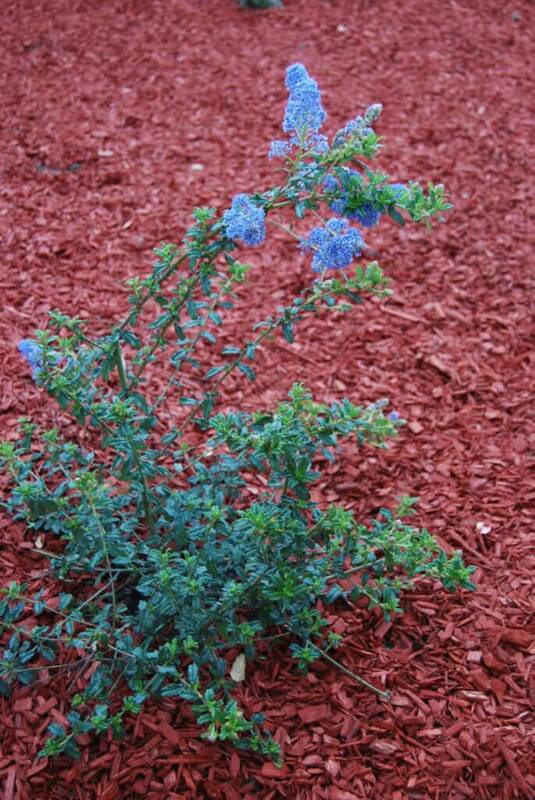 Close to the patio, a native plant from California flank the pathway with their tiny blue blossom and dark green leaves. Irrigation controller and drip irrigation was done for all the plants. In addition, a rain sensor was also installed, which is connected to the irrigation controller. When it rains, the rain sensor will send signal to the controller, which will delay the irrigation scheduled until the rain stops. A simple device can save even more water for the garden. How does it do in the rain? Right after the garden was installed, a much-waited-for rain came. For 3 days rain kept pouring down. How did the garden do? Very well. While the rain that fell on the driveway inevitably runs off, every drop of the rain that fell on the roof all went into the garden from the two down spouts. Plants love the rain water, which is not treated with chemicals, as is the case for in-house water. Plants grown up with rain water usually grow faster, stronger, and have better and larger blossom. After the project was finished, information such as garden photos were submitted to the Rebate Program, which issued a rebate promptly. 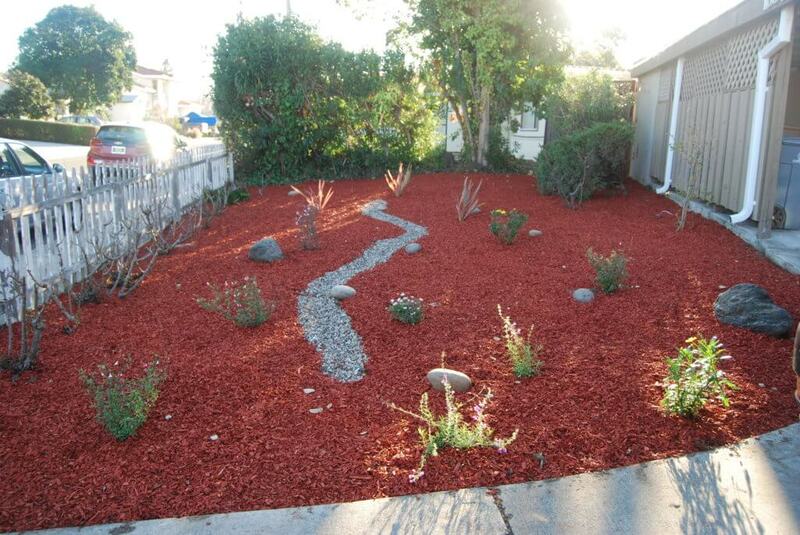 By converting a brown lawn into a water efficient garden, the space looks much more appealing. In a dry place like California, it can save 30-60% of water comparing with a lawn, saving cost and maintenance work. On top of it, when it rains, it can absorb every drop of the rain water, feeding the plants, and saving even more water. For all these these great benefits, you can receive a rebate of $1-$2 per square foot. We are not receiving the average level of rain this year; it looks we are going to have another dry year. We’ve got to be prepared for the dry time now. Why wait? Start today! When it rains, we enjoy hearing the sound of raindrops on our roof. After a drought of so long in California, those drops sound more like music to our ears. While enjoying the music, have you thought about where the stormwater goes to? Well, most of it just goes down the sewer, into the creeks and rivers, and eventually out to the ocean. What if that water is not sent away, but reused, such as, turned into beauty in your garden? In the past, stormwater has been treated as something akin to waste in cities, something that is collected and sent out to waterways in nature as soon possible. As people realize now, there are several issues of this. First, a big chunk of water is lost. Rainwater is freshwater that is basically clean in most circumstances. 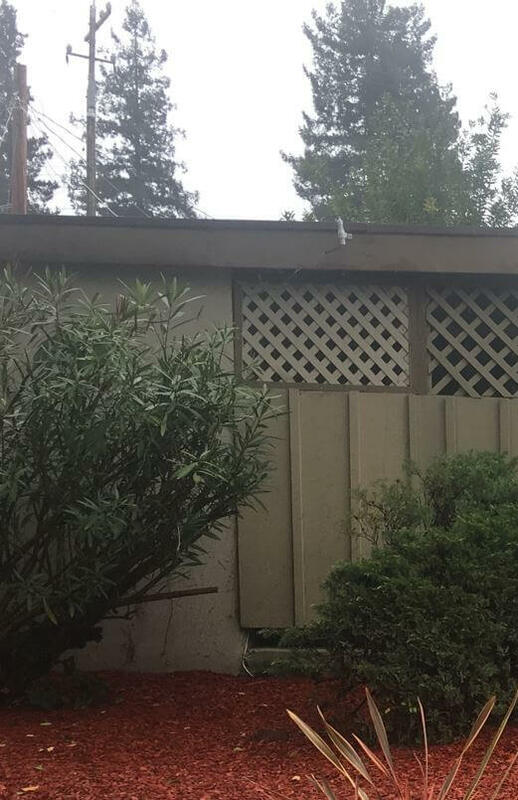 It falls right on our roof so no transportation is required to receive that water. However, in the current infrastructure, that much freshwater is sent right away. Another issue is pollution. As it flows through the surface of the city, stormwater runoff collects all kinds of pollutants such as motor oil, gas, chemicals, fertilizers, pesticides, etc. 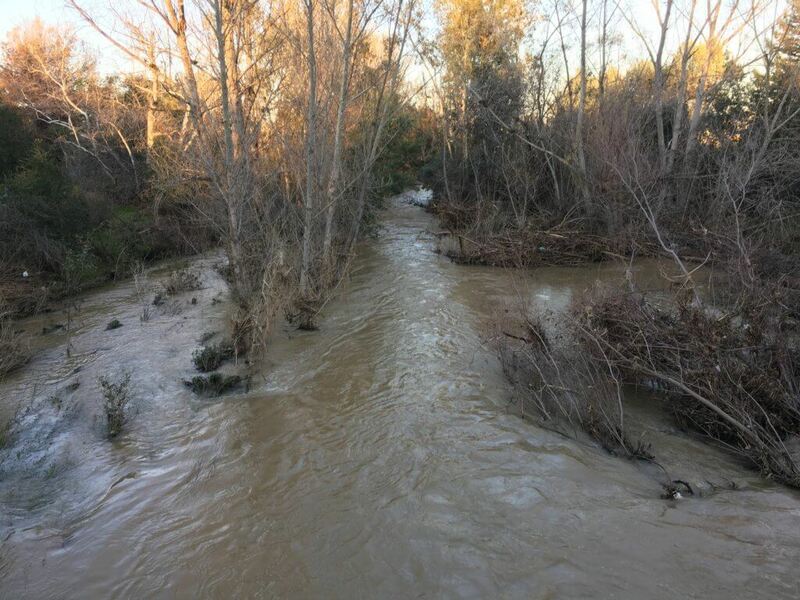 As the stormwater is discharged into the waterways untreated, the toxic substances can pollute the water and harm birds, fishes and other aquatic life that live there. One more issue is the loss of deep water infiltration. As the water that falls on impervious surfaces such as roof and concrete is sent right away, water that would otherwise have gone into soil, percolated and recharged the ground water is lost. As you can see, in cities where impervious cover is common, runoff can be as high as 55%, versus 10% with natural ground cover. It has become clear that rainwater is not a waste, but an asset, a valuable resource of water supply, something that we should capture and reuse. While a common way to do so is using a rain barrel, there is another more direct way – build a rain garden. So exactly what is a rain garden? To understand, we just need to turn our eyes to nature. In spring time, when we go to a nature reserve or park, chances are we can see fields and fields of wild flowers. No one ever installs an irrigation system or waters these plants; they just live and keep turning out splendid blossom, year after year. How do they do it? The answer is, after tens of thousands years, the native plants have adapted to the environment. 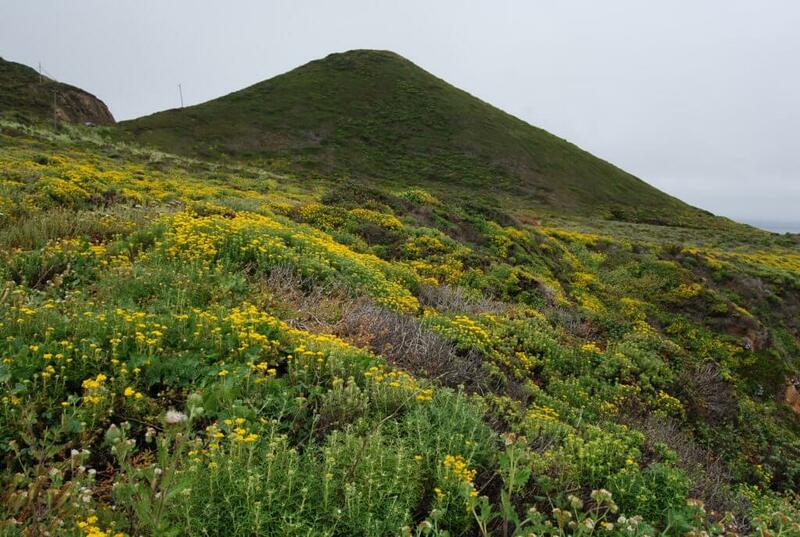 In California where it rains in winter and gets dry in summer, another area in the world that has Mediterranean climate, plants take in all the water they can get in winter, grow rapidly, and bloom in spring. When summer comes and it becomes dry, they slow their growth or simply go dormant. They stay this way until winter, when the rains come again. As the raindrops come down, they “wake up” from the dormancy, drink up all that water and start to grow and bloom again. They don’t need any additional watering; they just take all the water there is and live throughout a year. This is what plants in a rain garden will do. 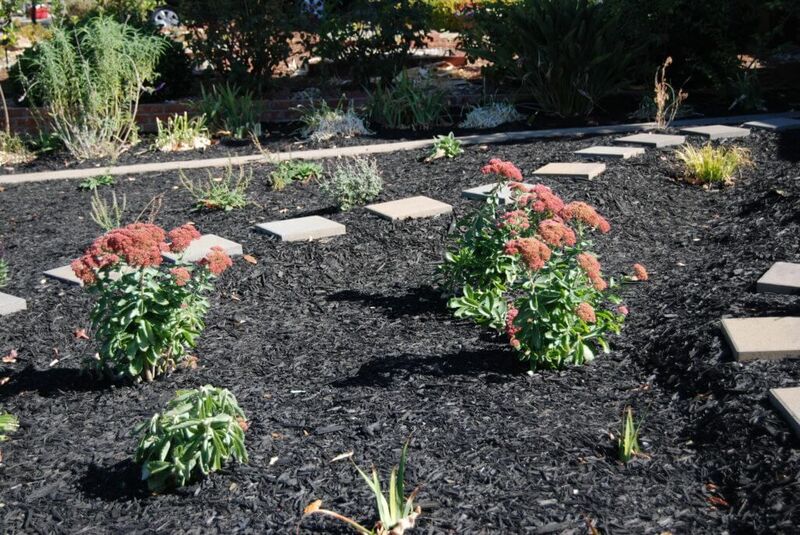 At a rain garden, the depression or ditch will collect the rainwater runoff from a roof. When it rains, water will be collected there. The plants in the garden will absorb the rain water, and grow; When the rain season ends, they can just live on their own. Very little or no additional watering is needed for these plants in most cases. Just like their brothers and sisters in the nature, they can live with just the rainwater. Compared with water supplied to each household, which is treated with chemicals to comply with the sanitary standards, guess which water the plants like better? Plants watered with rain water can usually grow faster, bigger, and have brighter blossom. 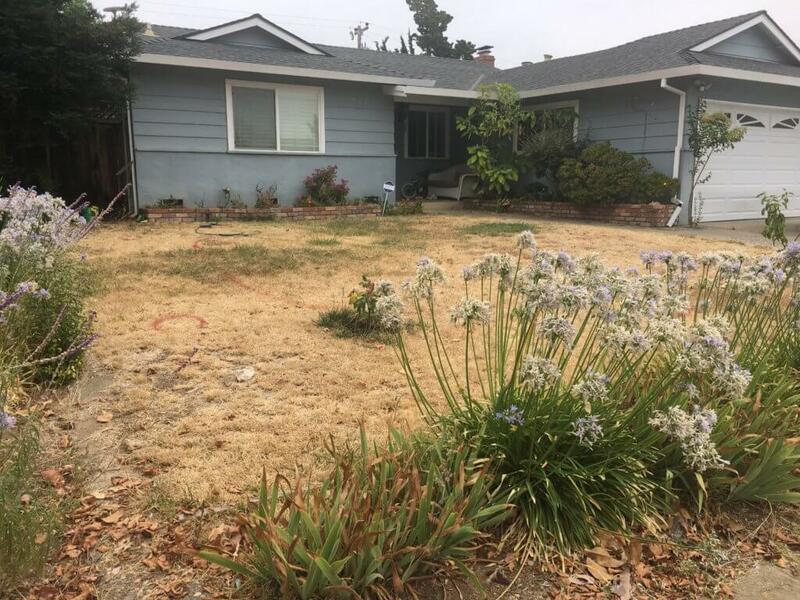 Like so many lawns in California, Larry’s (not his real name) lawn turned brown during the historic drought. 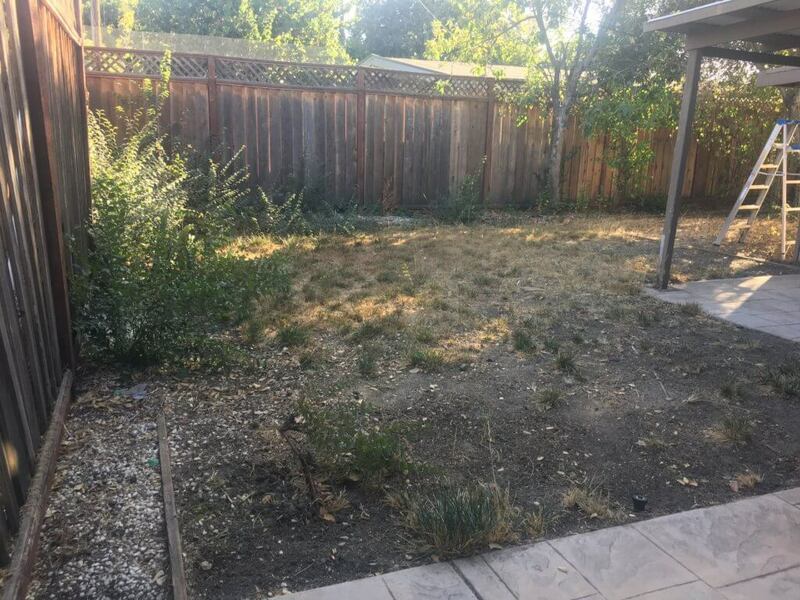 Though the drought ended and last winter was one of the wettest on record, the lawn did not come back . 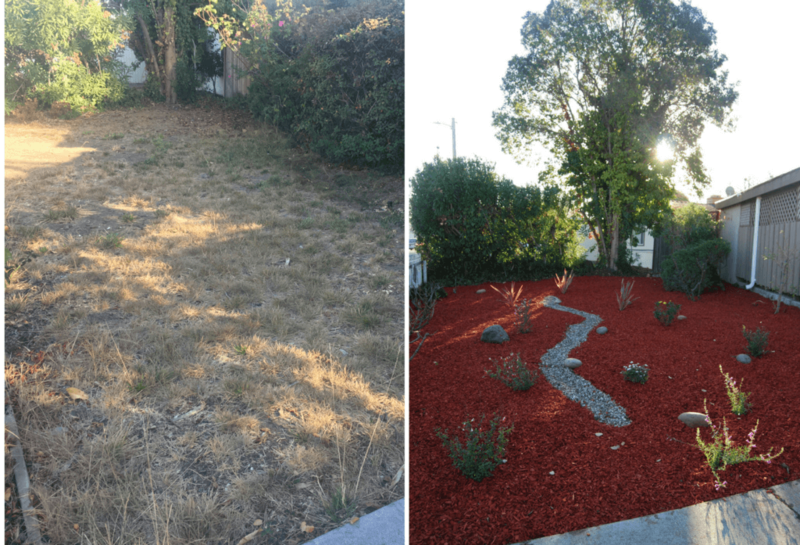 The brown lawn had been bothering Larry for a long time, but he was not sure what to do about it, until he heard that his lawn can be built into a beautiful garden; not just any new garden, but a rain garden! One of the downspouts (the one on the left) is right next to the front yard. When it rains, the rainwater will just flow into the garden. 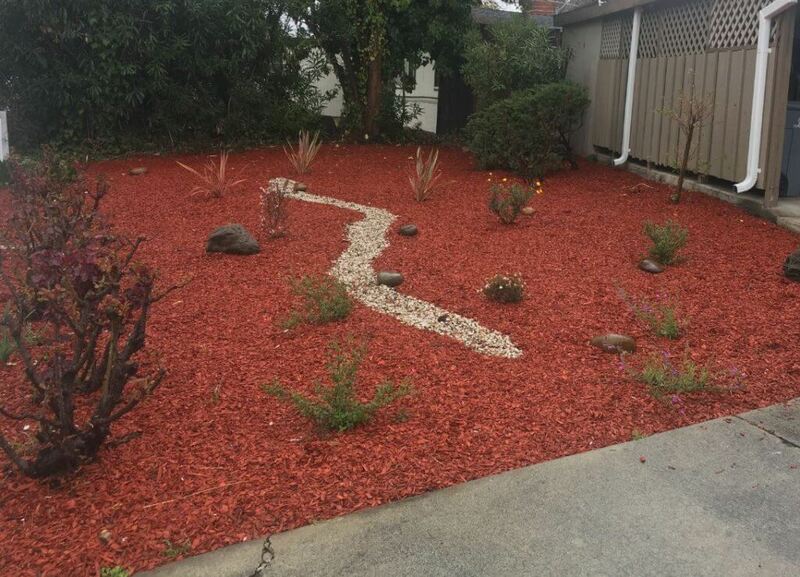 The lawn is on a very slight slope from the house to the sidewalk, so the runoff will go outwards naturally. 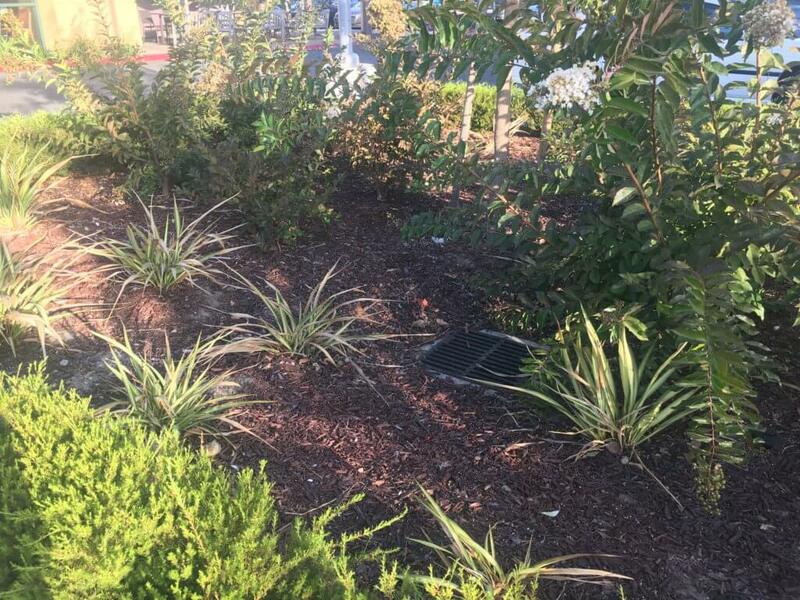 If a shallow basin is built close to the side of sidewalk, the rainwater can reach there and be stored in it. That is exactly the design proposed to Larry. A small winding ditch will take the rainwater from downspout, and send it to this shallow basin. Some plants will be planted. After they absorb the rainwater in winter, they may only need a little watering in the remainder of the year, saving a remarkable amount of water. 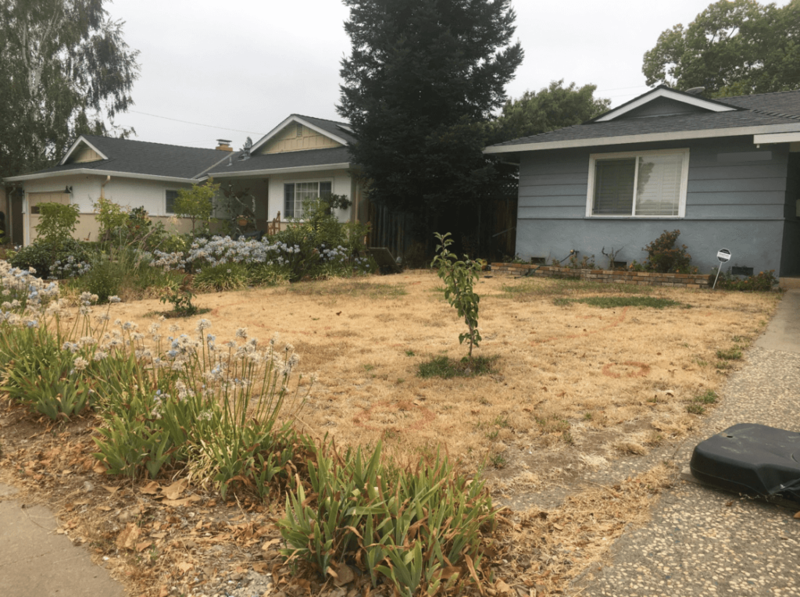 In addition, since the garden would meet all the requirements of Santa Clara Water District’s Landscape Conversion Rebates program, the garden can apply for the rebate. Larry liked the proposal. It was a “Go” for the rain garden! First, the shape of the garden needs to be defined. For the safety of the foundation, the rain garden should be some distance away. Usually it is advised that at least 10 feet of space should be left between the basin and the house. Next, the shape of the rain garden is outlined. How big should the garden be? It depends on how much runoff the roof can produce, and design an area that can take much of that runoff. Suppose the area of the roof is 1000 square feet, with one inch of rain, it can produce about 600 gallons of runoff. If the rain garden is 1 foot deep, to absorb this much water, it needs an area of about 80 square feet. If the roof area is bigger, the rain garden should be larger too. 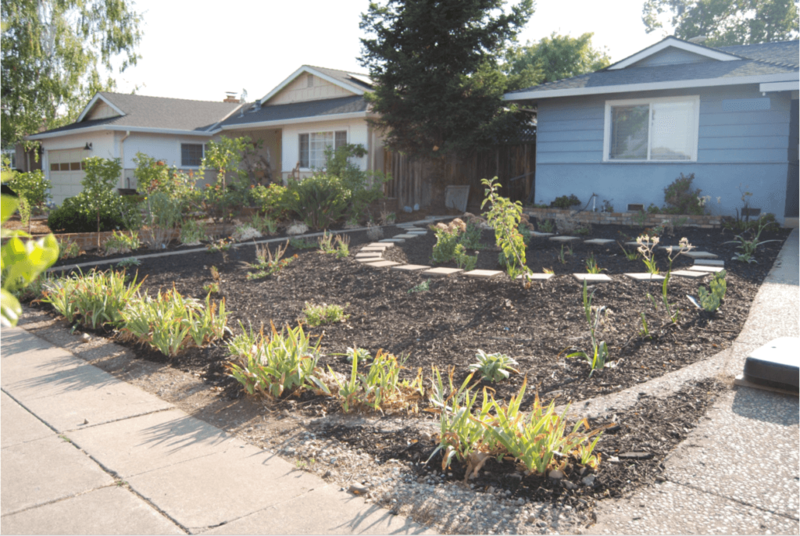 What shape can a rain garden be? It can be of anything – a circle, a bean, or a peanut. The smooth, curvy lines of these shape not only look appealing, but also reduce the force of runoff and effect of erosion. 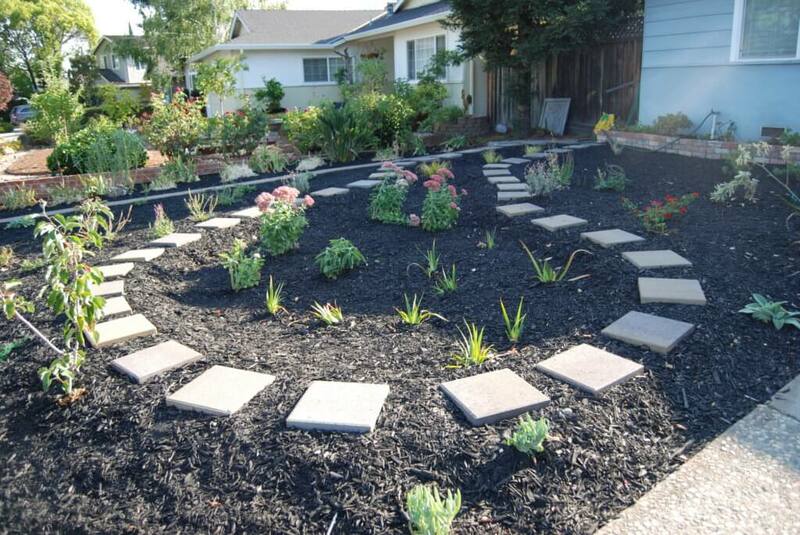 The bottom of a rain garden needs to be covered with a special type of soil, to help with water infiltration. It is a mixture of organic materials and coarse sand. The bottom of the whole area that water flows by and stays should be covered with the mix. 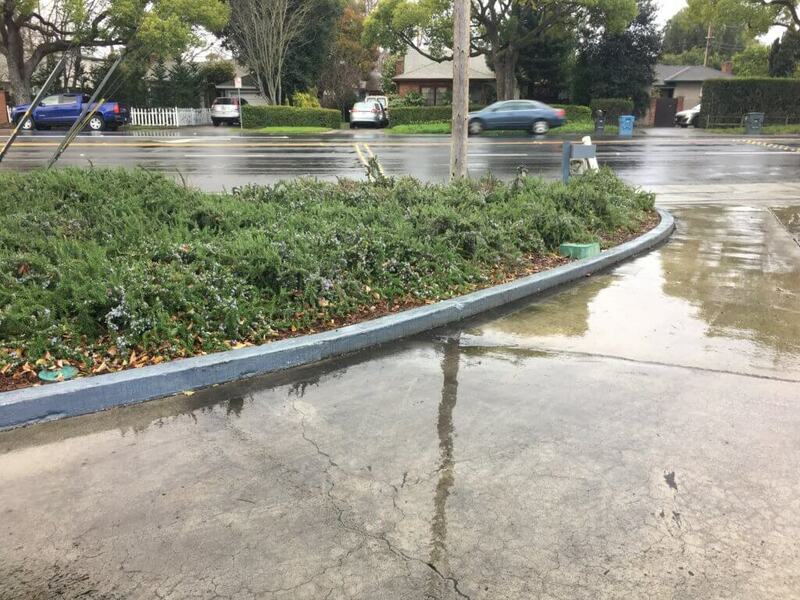 Plants in a rain garden should be able to stand both conditions well: wet and dry. Their roots should be able to take moisture for a long time, yet also survive in hot dry summer. 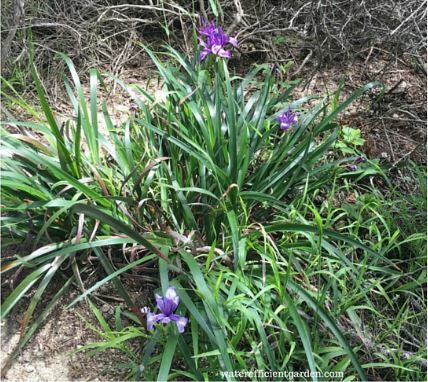 One plant that fits this very well is the Douglas Iris. A tough California native, it can be found close to beaches along the west coast. 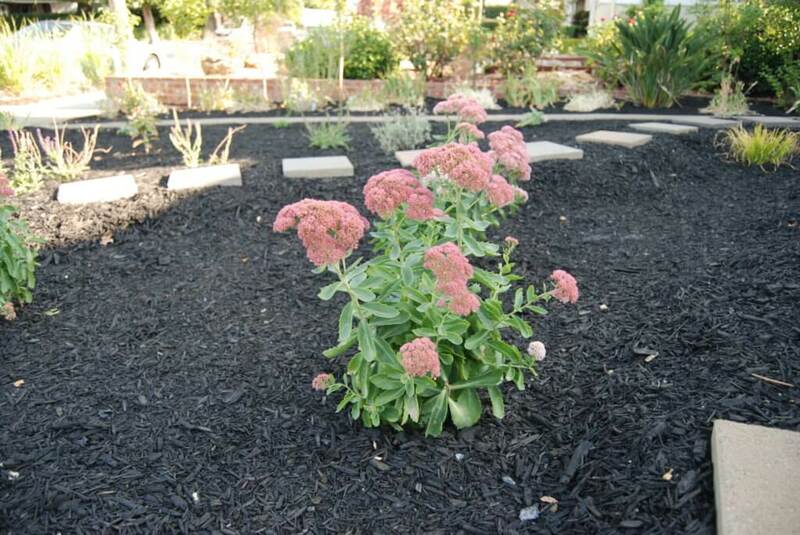 Hardy, drought tolerant, yet tolerant of wet soil, this is great choice for a rain garden. When it rains, with a garden like this, the rainwater will be captured, and reused. Something that was sent away before can be turned into so much beauty in our own garden!